What: The Steel make their way to Central Florida to face the Sharks. When: Saturday, May 21 at 4 p.m. (PT). Where: Jacksonville Veterans Memorial Arena; Jacksonville, Florida. This season: July 16 - Sharks at Steel. Series History: Regular Season - Steel lead series 2-0 (1-0 on the road). 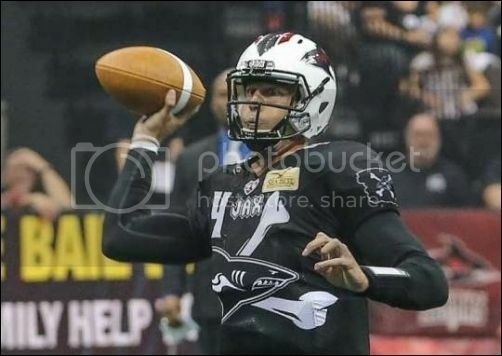 Note: This game matches the past two quarterbacks which lost the ArenaBowl; Shane Austin (Cleveland Gladiators in ArenaBowl XXVII) and Tommy Grady (Jacksonville Sharks in ArenaBowl XXVIII). The Steel are in 0-6, 0-5 on the road and 0-3 in inter-conference play. They are coming off a 55-48 overtime road loss to the Cleveland Gladiators on May 9. They are averaging 34.3 points per game and are allowing 65.3 points per game. The Steel are fourth in the National Conference. The Sharks are 2-4 overall, 0-2 at home and 0-2 in inter-conference play. They are coming off a 41-40 road loss to the Cleveland Gladiators on May 7. They are averaging 49.2 points per game and are allowing 51.8 points per game. The Sharks are third in the National Conference. Yards per Game - Steel 278.0; Sharks 323.0. Note that both teams have played six games. There may be a glimmer of light at the end of the tunnel. The Steel were just one penalty affected extra point away from pulling out the win on Monday against the Cleveland Gladiators. Forget about the four turnovers. Forget about the 20-point deficit. Forget about an untimely infraction at the end of regulation. What we have is the most fight this team has put up this season. The 55-48 overtime loss to the Gladiators was certainly a heart breaker. There is a new vibe with the Steel and that starts with the installation of Shane Austin at quarterback. The former University of Hawaii star completed his first nine passes, including a pair of touchdown passes to Tom Gilson in the first quarter. He finished the game completing 36/56 passes for 363 yards and 6 touchdowns. He showed some rust in the middle quarters, throwing 4 interceptions, but that is only bound to improve. The most impressive part of his performance was the rally from 20 points down in the fourth quarter to tie the game on a five-yard pass from Austin to Tyrone Goard on the last play in regulation. Then, in celebration, Goard took off his helmet which resulted in an unsportsmanlike conduct penalty. The infraction knocked the Steel back 10 yards for the extra point attempt. In arena/indoor football kicking, 10 yards might as well be a mile. Ernesto Lacayo, who had made all six of his extra point tries to that point, kicked the ball wide left. The result was overtime in which the Gladiators prevailed. There are no such things as moral victories in sports, but this performance should give the Steel some optimism. Gilson caught 16 passes for 160 yards (Portland franchise records) to go along with his 2 touchdowns. Goard nearly duplicated Gilson's performance with 14 catches for 136 yards. He also had two of his three touchdown grabs in the fourth quarter. The Steel suffered some injuries in its receiving corps, losing Terrence Mitchell for what appears to be the long term, and Jared Perry, who is likely to miss at least the game against the Sharks. Portland's defense came up big in the fourth quarter as Sergio Gilliam and Christian Wise both intercepted passes to set up Steel scoring drives. Reggie Wilson and Brandon Sesay are becoming a formidable duo on the defensive line. It is an old story, but it the Steel are to beat the Sharks, it will come down to cutting down on penalties and eliminating turnovers. Player to Watch: Shane Austin (QB). Wild Card: Christian Wise (WR/DB). Jacksonville did not expect to start its season at 2-4. There is no question the Sharks have talent. They possess one of the best passers in the AFL and he best running back in the AFL. They have the leader in receiving yards per game. They are the defending American Conference champions. Something seems to be missing as they look to return to the ArenaBowl. Tommy Grady leads the team, having completed 154 or his 232 passes for 1,783 yards and 32 touchdowns. He has thrown just 3 interceptions. Grady is a 6'7" passer who towers over even his offensive line. He is capable of using the tools around him to put up points in a hurry. Derrick Ross has been the top AFL fullback for a few years now, and with numbers like 156 yards and 10 touchdowns, it's pretty easy to see why. He can create nightmares for opposing defenses and is a load to stop. Joe Hills' 132.0 receiving yards per game leads the league. On the season, Hills has caught 60 passes for 792 yards and a league-high 18 touchdowns. If that were not enough, Anthony "Tiger" Jones comes in at 46 catches, 579 yards and 8 touchdowns of his own. Roger Jackson is the third receiver with 268 receiving yards and 3 scores. Former Portland receiver Jamar Howard, who was traded to Jacksonville three weeks ago for offensive lineman Duke Robinson, is listed on the active roster (according to the AFL's official site), so he may see some action in this one. Defensive back Greg Reid is the jack of all trades for the Sharks, leading the defense in total tackles (44.5), passes broken up (8), passes defended (11) and is tied for the lead in interceptions (3). He leads a decent defensive backfield which hopes to be opportunistic against the Steel. Fellow defensive back LaRoche Jackson has 33 tackles and 3 picks of his own. David Hyland has recorded 32 sacks and a fumble recovery. Former Portland defensive lineman Antron Dillon is on the active roster and, like Howard, could see some time for the Sharks. Linebacker Dexter Jackson has a pair of sacks on the season, as does defensive lineman Khreem Snith. The Sharks will need to get down to some basics and play sound, fundamental football and they should find themselves with an opportunity to come away with the win. Player to Watch: Tommy Grady (QB). Wild Card: Joe Hills (WR). “Shane looked sharp. I was confident he could give us a lift (against the Gladiators), and he did. 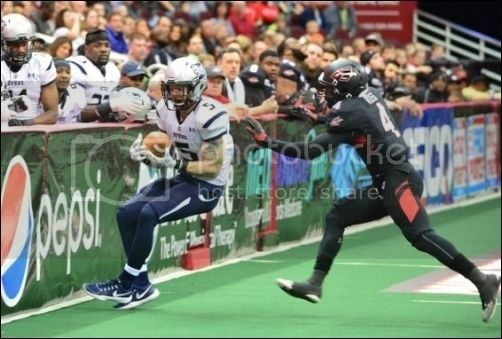 He gives us a leadership factor and the experience at the position we haven't had this season,"
Portland will be facing a pair of its former players, as WR Jamar Howard (left) and DL Antron Dillon are now with the Sharks. 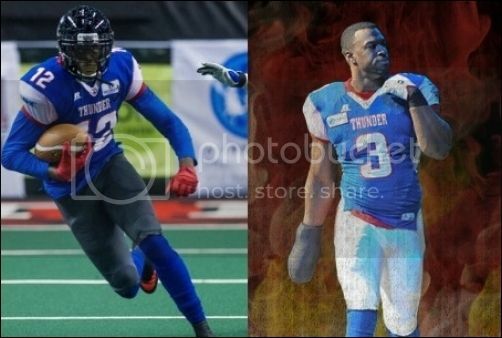 Howard played during the 2014 and 2015 seasons for the Portland Thunder, and Dillon was a mainstay on the line for the Thunder in their inaugural season of 2014. Portland's greatest success as a franchise has come against the Sharks, which they have beaten both times in which they have played. 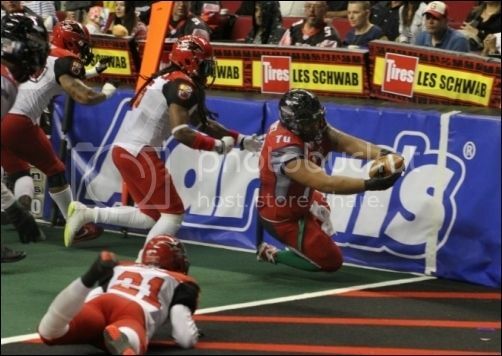 Above, former Thunder FB John Martinez scores a rushing touchdown in Portland's 72-48 win over the Sharks in 2015. The 72 points are the highest point total in Portland history. Portland earned their first-ever franchise victory over the Sharks in the sixth game of the 2014 AFL season. Below are the historical results. Click on the links for the boxscores. Gonna be tough going against the Sharks in Jacksonville. That said, we don't know which Sharks team we are going to get. I call them the Jekyll and Hyde team because with that talent on the roster, Jacksonville should be better than their record. Sometimes they look it, sometimes they don't. I'm personally rooting for the bad Sharks to show up tonight, only because of how funny it'd be to hear the Sharks owner explode about how underperforming his under-the-table team is performing. this could be a good game. i'm watching and rooting tonight with my aunt. We're just about under way. Go Steel! We've got this! Heidi, I'll handle end of quarter/halftime/end of game stats. If I have to leave at some point, I'll inform Angi or someone. That sounds great! I'm looking forward to it! Kickoff has been delayed a few minutes due to pre-game festivities in Jacksonville. Should be about five minutes until kickoff. They still have not updated the Empire-Fever boxscore from last night. The IFL needs to get better at that. Spokesman-Review has a box score, but its omitting some key stats and they spelled JJ Hayes's name incorrectly as "Haynes". I'm hoping they get that box score fixed. Soon. I prefer my previews to have up-to-date stats. What is the big deal with having motorcycles on the field in the AFL? is kind of obsessed with it. Whew! Cuatia is not referring this game! The Steel might just have a chance. Sharks win the toss and choose to take the ball in the third quarter. Steel will get the ball first. That might end up having to be what we use.